One of my favorite times of year here in Hawai`i, is what we call “winter.” Yes, there is a difference between summer and winter here. Even in Florida, Southern California, and Arizona (all states where I have lived in the past), there is a distinct change between the temperatures in July and those in January. Here, there is no noticeable change in temperature from month to month all year. From late November until mid-March, however, there is a change in what is blooming along the roadsides and in our gardens. 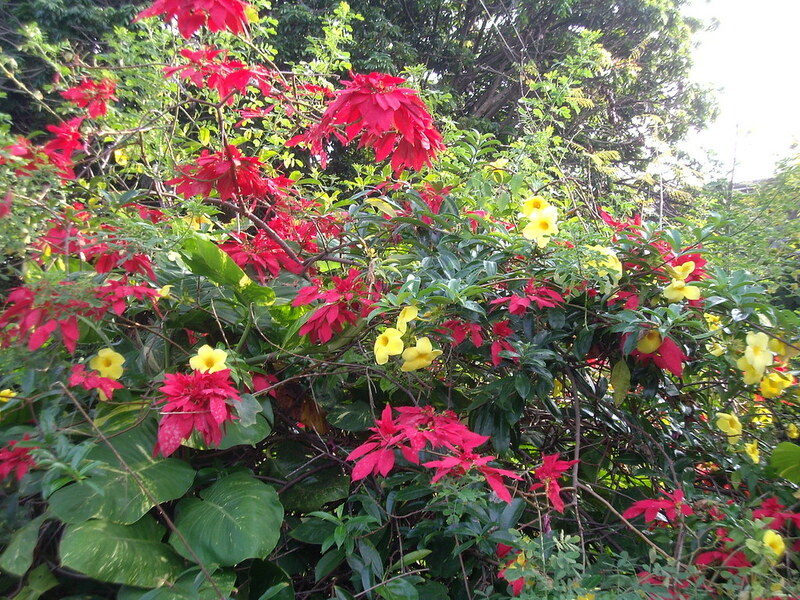 For example, the road I drive to the college where I teach seems like one huge embankment of of poinsettias (Euphorbia pulcherrima). “Pulcherrima” means “very beautiful,” and it is. There is no way to compare these with the little pots of poinsettias you can purchase in grocery stores. 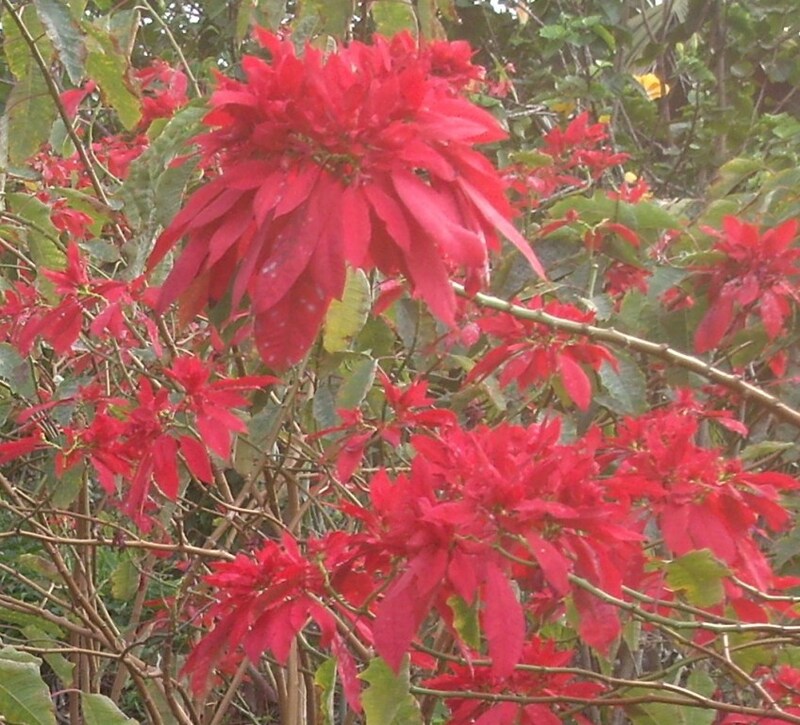 Against our rich forest green, the brilliant reds are almost florescent. Then throughout March, I look for those little drops of red in the midst of jungle growth that keep hanging on. When they are all gone, I know that it is winter is over! 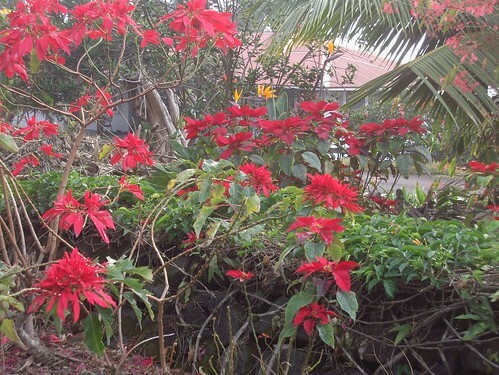 My first experience with poinsettias took place back in the early 70s when I was a student in the ornamental horticulture department of California Polytechnic State University, San Luis Obispo (Cal Poly). We made a field trip to visit the Paul Ecke Ranch in Encinitas, CA where over 70% of the poinsettias in the United States and over 50% worldwide actually begin. It seemed like there were acres of greenhouses filled with poinsettia cuttings in all varieties and stages of growth. Please follow that link to view the history of that ranch as well as the history of poinsettias in general. 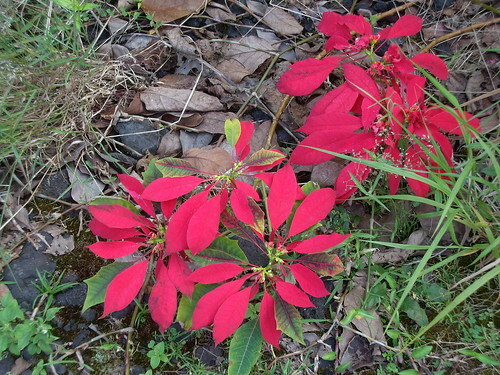 Poinsettias flow over onto the ground and almost seem to take over everything else. I love the way they intermingle with the yellow hibiscus. Such a dazzling display of color! 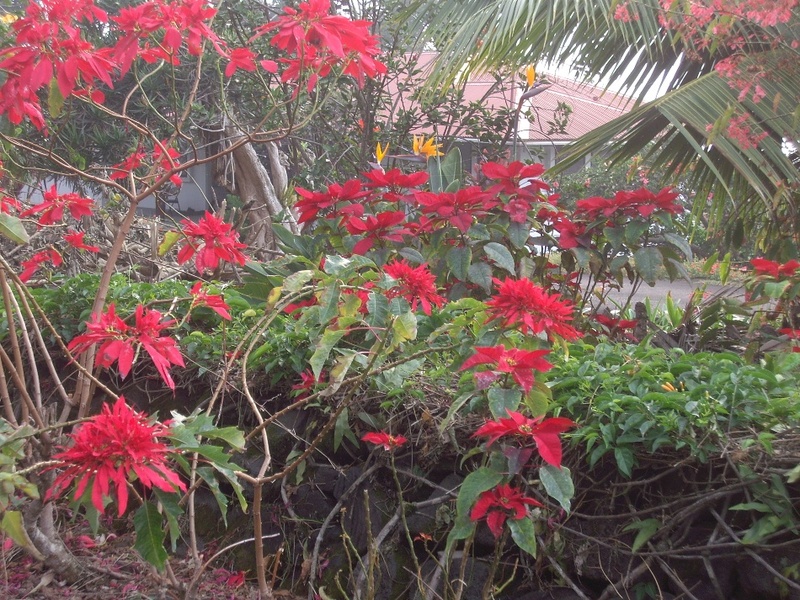 This is a sight few of you will see at Christmas outside of Hawai`i. 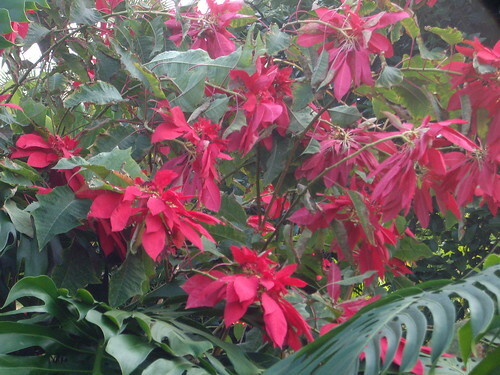 Poinsettias are originally from Mexico and named for Joel Roberts Poinsett, the first United States Ambassador to Mexico in the 1920s. The rest, as they say, “is history!” The following paragraph is taken from this article. I suggest you read the whole thing (it’s short). 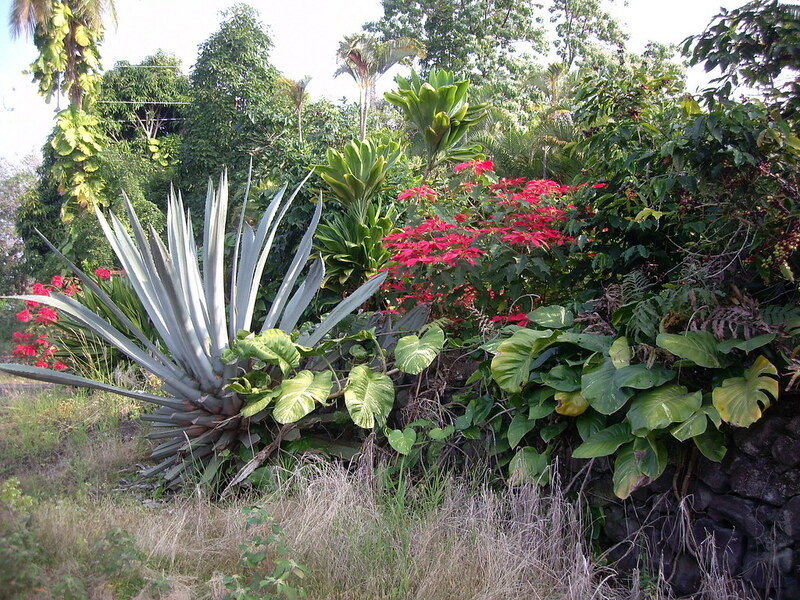 During his stay in Mexico he wandered the countryside looking for new plant species. 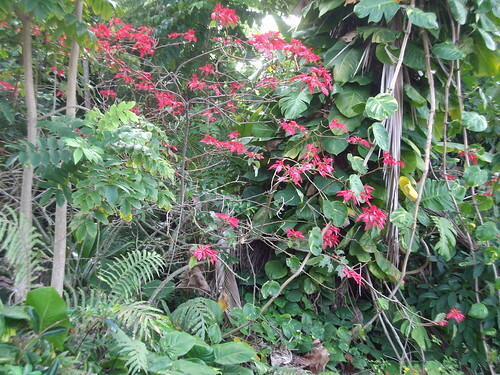 In 1828 he found a beautiful shrub with large red flowers growing next to a road. 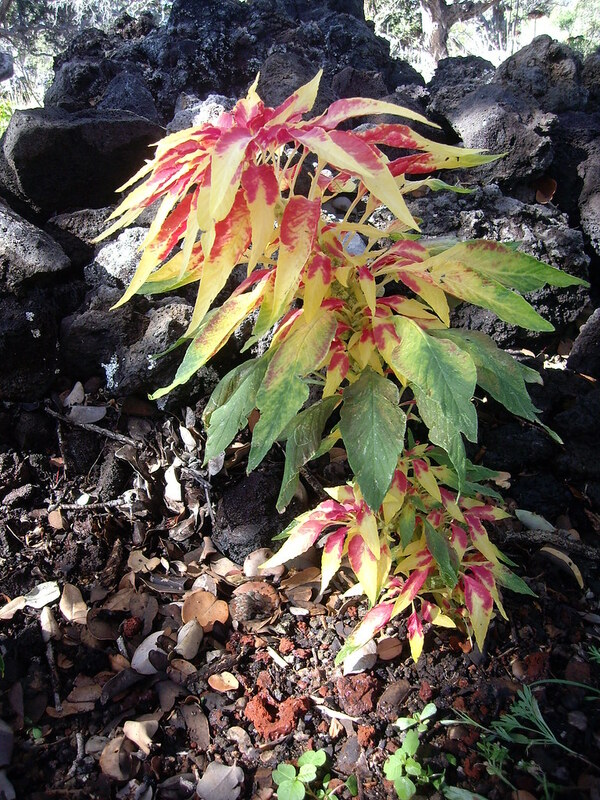 He took cuttings from the plant and brought them back to his greenhouse in South Carolina. I remember when I lived in Southern California how people would plant the small potted plants they bought at Christmas time. 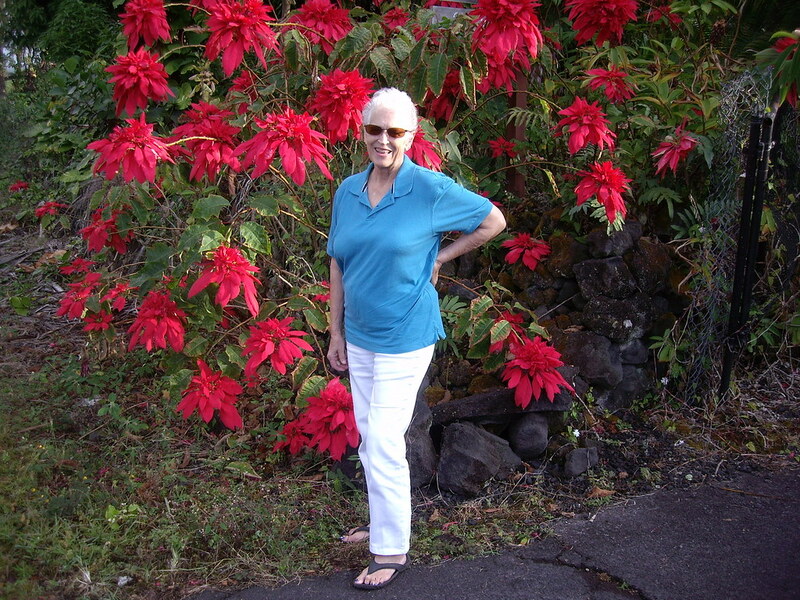 Many of the homes there had nice stands of poinsettias, but none reached the size or proportion of the ones here. 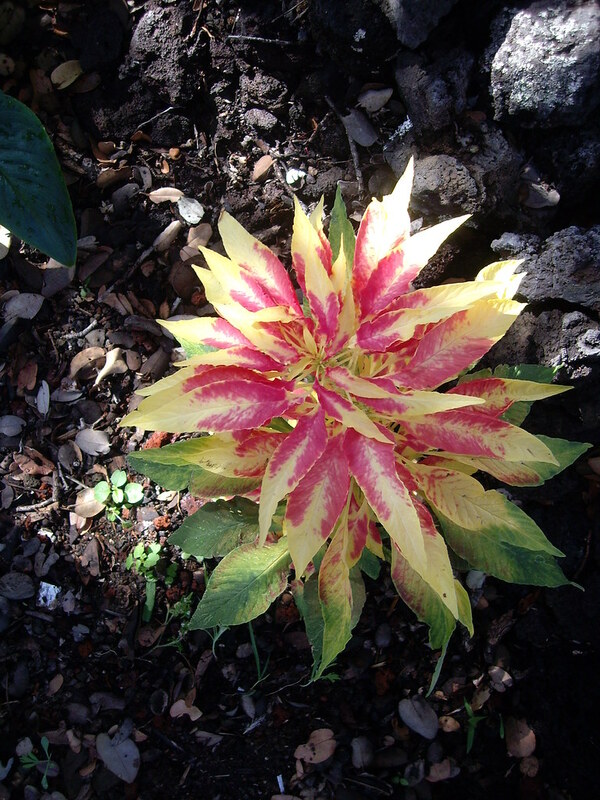 If you are interested in what to do with your Christmas poinsettia plant, go here to read up on it. 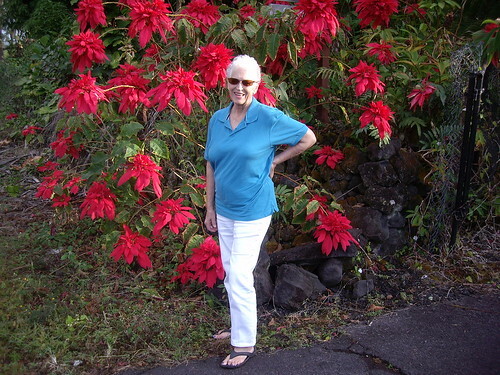 Another good site on how to choose and care for your poinsettia, and what to do with it at the end, go here. Many of the poinsettias have found their way into the wild tangles of growth. Others are a featured part of a home’s entryway. You can see why I’m obsessed with taking just the right pictures to illustrate this stunning plant. I really do empathize with those of you who are suffering under ice storms and record-breaking snowstorms. I have lived in Alaska, Illinois, and Rhode Island and gone through similar experiences. But I couldn’t go back to it, now that I’ve seen Paradise! I couldn’t end this post about poinsettias without showing you a picture of the Summer Poinsettia (Amaranthus tricolor Perfecta) I planted in my patio. It has grown considerably since I showed it to you in October as a small cutting. Here it is from the side, with all the keiki (babies) coming up at the bottom. Here is a beautiful shot of it from the top. 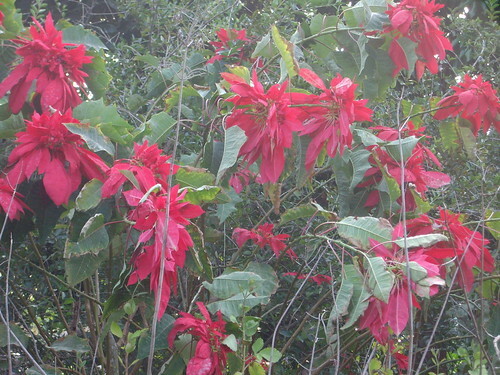 Whether you are celebrating Hanukah, Christmas, Winter Solstice, Yule, Saturnalia, Kwanzaa, or any other festival at this time of year, poinsettias are a celebration in themselves! 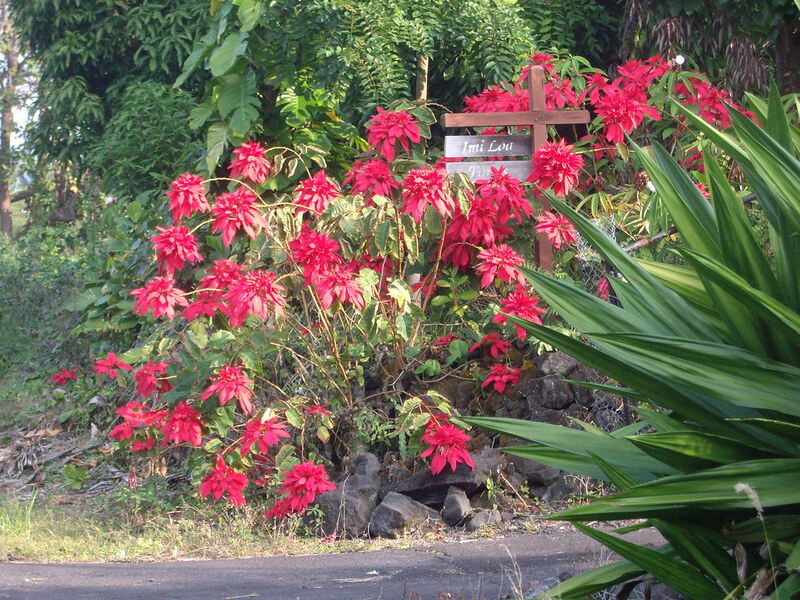 This is Lava Lily wishing each of you a most joyful and safe holiday season!